Weight : 2. 000 kg approx. Size : 19 inches blade approx. Material Used : Iron, brass, leather etc. Weight : 1.700 kg approx. Size : 25 inches blade approx. Weight : 1.200 kg approx. Material Used : Iron, brass, wood, Rexene etc. Handle Material: Wooden and leather scabbard with brass fitting. 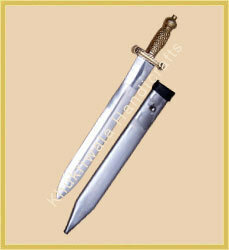 We are offering USN Cutlass Sword. It is 1862 pattern anchor sword manufacture with high Steel carbon and calf Leather. It is the symbol of good handmade craft. WWII German SS Saber with Steel guard, single fullered blade. Includes black steel scabbard.Overall is 35", Blade is 29.5" and Handle 5.5"